I’m a cauliflower lover and roasting is my favorite way to cook it. It’s crisp/tender, and the roasting really brings out the best in cauliflower. I’ll eat it just as is, on its own, dress it up for a fancier side or use it as a part of another recipe. Heck, I’ll eat it like some people eat popcorn! 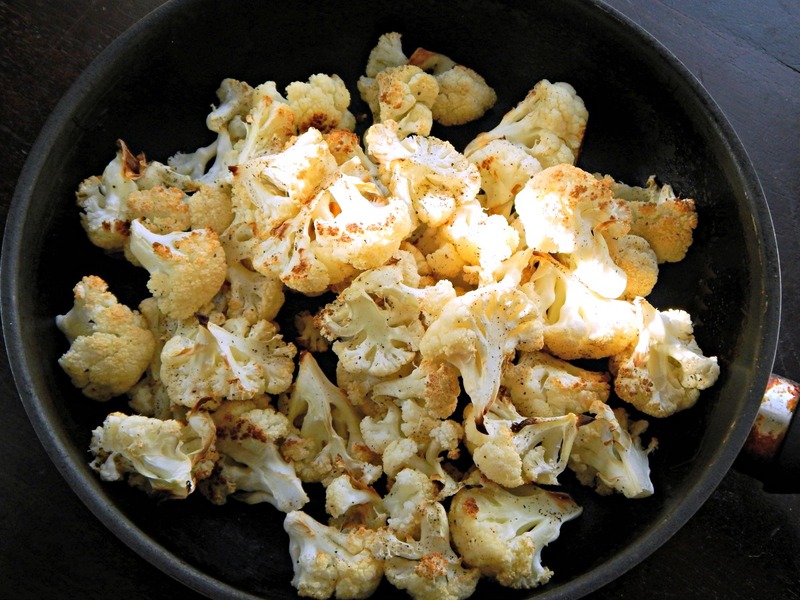 Cauliflower roasts up so nicely without any oil at all and still manages to taste amazing. You can drizzle it with a little oil if you’d like but it’s perfectly good, although a little plain, just like this. A little smidge of melted butter when serving turns this into a lovely side. Did you know how you cut cauliflower or broccoli can save on waste? Instead of slicing through the florets, put the tip of the knife through the stem portion only and slice through – the pieces of the “flower” will easily separate and leave very few crumbly bits behind. Later in the week, I’ll post a couple of ways to use Oven Roasted Cauliflower, one an appetizer and the other a side, so stay tuned. In the meantime, try it, you’ll like it! As far as shopping, cauliflower is sold by the head or by the pound. If you’re a cauliflower lover like I am, you’ll start to get a feel for which is the best way to buy it in your area. A medium head (about 6 – 7 inches across) runs about two pounds and will give about three cups of florets, according to the Produce Converter. And do always watch for cauliflower on sale; it keeps very well. If you’ve let it sit too long and see a dusting of discoloration, it can be trimmed off. Spread the cauliflower on a baking sheet and season with salt and pepper. Roast in the oven, turning once with a spatula, until golden brown at the edges and cooked to desired tenderness, about 20 minutes. If desired, drizzle with melted butter before serving. This entry was posted in Click here for Fabulous Food Posts and tagged Cauliflower, Easy Recipe, Frugal Hausfrau, oven roasted cauliflower, Vegetable Side. Bookmark the permalink. I’ve never done that but I’ll try itnext time. It does sound better than potatoes. We should all roast our cauliflower. I find your blogs so interesting. Great surprises. The pictures tell all. You are a foody Connoisseur! I have nominated you for the “Blogger Recognition Award”. You have an outstanding blog. Your colours are at times sensational! 💖 I hope you will accept the award. You need to go to my blog for details. simplysplendidfood.com. Thank you for having a great blog! . Tell me about it! I roast entire (chopped up) cauliflowers and end up eating the whole thing myself!! I made one back in the ’70’s, but haven’t made one since! I remember that blog post and it looked SO good! I had no idea either you can roast cauliflower without oil! Thank you for the tip! 🙂 Coming soon, I hope!! Interesting. The British will roast anything short of the dishrag, but they usually coat it with oil first. I don’t tend to roast things, but if you can do it without the oil I’d be tempted.